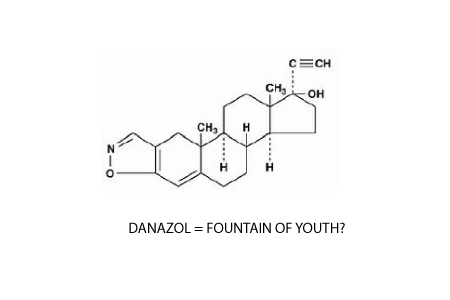 A new study published in the New England Journal of Medicine shows what many hope might be a “fountain of youth”. A synthetic male hormone known as Danazol was tested for two years and lengthened telomeres and clinically stabilized disease in people with genetic mutations in telomere maintenance. Firstly, male hormones do affect gene expression. Take for example this page from my website explaining testosterone versus Human Growth Hormone with respect to gene expression. In this video, I explain why TA-65 may to be safer than HGH although the latter is wildly popular among many. The question of how a male hormone might lengthen telomeres is an interesting one. My standard explanation for my stem cell theory of aging and disease is that regular cells are not telomerase active. Only stem cells are telomerase active although this may be an oversimplification. So the actual “lengthening” occurs not directly on the drone bees but on the queen bees which are then represented by clone cells with longer telomeres. I am currently writing a book called The Telomere Miracle for Hay House, due in 2017 and as it takes shape I have come to understand that you can correlate many things with telomere length such as breathing, exercise, diet, mindset, social relationships….anything. But the take home point is that something like danazol can have positive effects but there are potential negative ones as well. We should be careful not to jump onto the next big thing when we have everything we need to stay young inside. This study was a great one because it addressed individuals with telomeropathies. But it would have been even better if it had used a telomerase activator rather than an indirect hormonal mediator like danazol. I have been told that this a “Deeply flawed study”. Peripheral lymphocyte telomere lengths are used as biomarker and these are unreliable markers of aging. This a worthless study. I recently read a paper on this by Michael Fossel in which he shows that research points out that there is no relationship between length of these type of telomeres and probability of death. Of course anybody can read the paper for themselves.